For me, there are two national chain stores, in particular, that stick out like sore thumbs in New York City. It's not their product or decor, but their vibe and the way the employees talk to you. 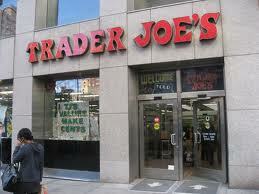 The two stores I'm thinking of are Trader Joe's and Patagonia. There are probably others out there. But if you've shopped at either of these stores, you know exactly what I mean. The employees talk and act like they're not from New York. Almost like they're aliens or something. I was reminded of this tonight as I made the brilliant decision to hit up Trader Joes Union Square around 8pm. Even with the store's notoriously long lines, your cashier still manages to tell you all the details about his rad hiking trip that he went on over the weekend. While it's certainly comical, I have to say it's also kind of refreshing. I think us New Yorkers can learn a lot from the good folks at Trader Joes. Like slow down. Exhale. Sometimes we forget to do that. Jon, thanks for the link! Very interesting read.